Tyson Fury sat down with popular American podcast host, stand-up comedian and MMA commentator Joe Rogan on Thursday night. Fury gave an incredible insight into his life since his triumphant victory against Wladimir Klitschko on Rogan’s extremely popular podcast ‘The Joe Rogan Experience’ from his studio in LA. Fury’s mental health issues and road to recovery were explained in detail by the lineal heavyweight world champion in what was a deep and inspirational conversation with Rogan. Tyson of course had time to speak about his upcoming opponent, America’s WBC world heavyweight champion Deontay Wilder. The two giant athletes go toe-to-toe on December 1st at the Staples Centre, Los Angeles live on BT Sport Box Office. Tyson told Rogan that he “hand-picked” Wilder as his opponent and explained how Wilder was a catalyst and motivation for his incredible comeback to the sport. “I see this video of Deontay Wilder saying ‘Tyson Fury is finally done’. The ‘Gypsy King’ also found offence in Wilder’s choice of words towards a heavyweight great; which happened to be about the boxer that Fury was named after. “Before that, he was talking about Mike Tyson and how he’d knock him out in a round. “And I thought to myself: ‘That’s very disrespectful to talk about someone who is not even in your era and all that sort of stuff’. “So, I thought to myself: ‘If I ever do fight you I’m going to give it to you for that reason’. Tyson Fury and Deontay Wilder have been back and forth with each other dating back to before Fury’s famous upset against Klitschko. The rivalry between the pair has intensified since the announcement of the fight and participated in a feisty media tour which saw the heavyweights come-together on several occasions. Fury made sure he had the opportunity to share his reason on why he defeats Wilder convincingly on December 1st when speaking to Rogan. “Deontay Wilder is a one-trick pony.” stated Fury. “It’s a good trick though!” joked Rogan, with Fury responding with “It’s a very good trick, but we all know what happens when that trick doesn’t land… you’ve lost! 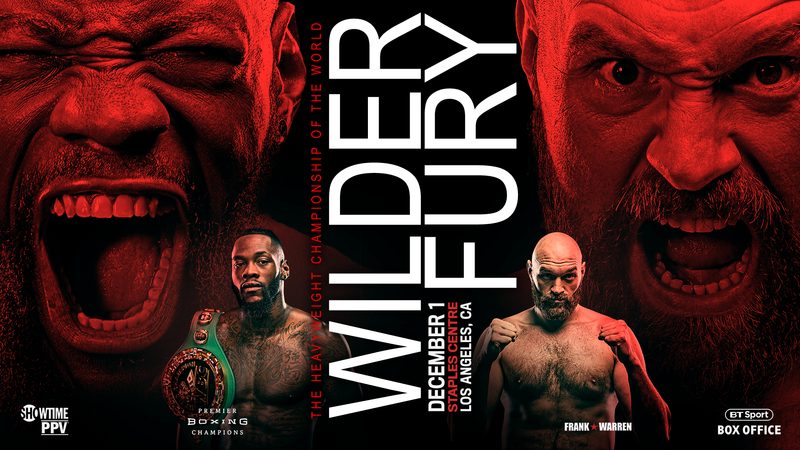 Deontay Wilder puts his WBC world heavyweight title on the line against the lineal heavyweight world champion Tyson Fury in a clash between the undefeated giants on December 1st at the Staples Centre, LA, live on BT Sport Box Office.